You know that you’re sick when you need a nap after running to the mailbox. Oi. On a side note, this past weekend was Halloween! Woo hoo! Only, I received more of a trick than a treat. See, I spent the better part of my week last week preparing sweet goody bags and cake balls for my coworkers. Obviously, I missed my true calling as a kindergarden teacher. Well, I guess that my body disapproved of all of the extra effort and late nights because Friday night it shut down on me. I got a crazy feever and swollen tonsils. Woo! I spent the majority of Saturday being nursed back to health by my loving mister and well, sleeping and talking nonsense. But that’s not fair! I love Halloween! So I got dressed in my costume and headed out to a party. Little did I realize that the effort it would take me to get to said party woulder render me no fun. We had to call it an early night and get me hopped up on cold meds. Maybe next year I’ll be awake past midnight. How was your holiday? PS. I allowed for a few photos in my sick state because I really liked my costume. 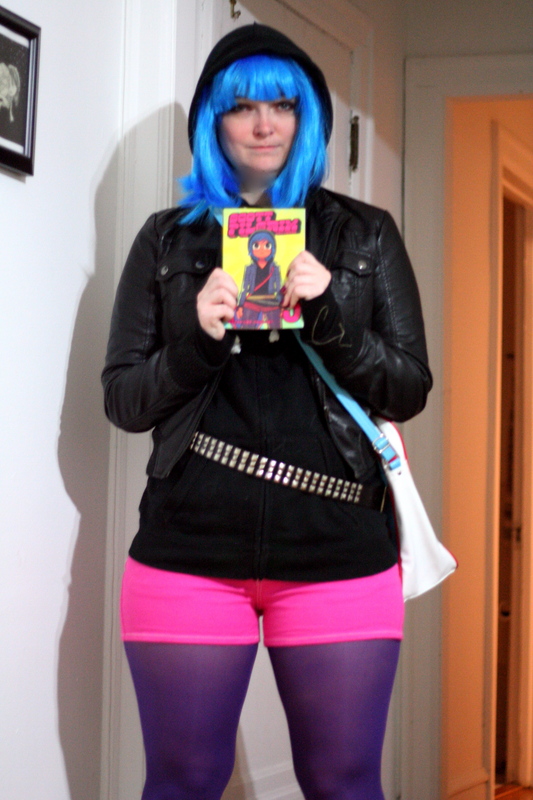 I went as Ramona Flowers from the Scott Pilgrim comic book series.